Amid a 12-hour journey, there's expectation on the face of Liu Xi (pseudonym) and his son for the long train journey. Liu, a construction worker who has worked in Beijing for several years, stood in front of the Beijing Railway Station with his son on Tuesday. 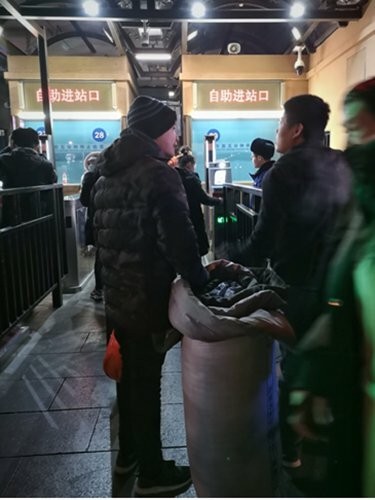 Liu cleaned his son's face and wiped his sweat in Beijing's freezing temperatures, and told the Global Times he hoped to return home early even though he didn't earn much this year. The father carried an old plastic woven bag on his shoulder with a similar bag held by him and the son. The bags had a roll of quilt and daily living supplies. He said that he bought the cheapest tickets and would spend 12 hours standing all the way to their hometown, Tongliao, North China's Inner Mongolia Autonomous Region. "I surely miss home although I like Beijing as well…My mother is working in another city and promised she would buy a secret gift for me," said the son, a grade six student in Beijing. Liu is just one of the millions of people who are making the trip during the largest human migration on Earth, chunyun, which began on Monday. The 2019 Spring Festival travel rush from January 21 to March 1 expects to see about 2.99 billion trips, up 0.6 percent, said Lian Weiliang, vice minister of the National Development and Reform Commission. Going back to their hometown for the Spring Festival is standard for most Chinese people. As the old saying goes, "We must go home for the Spring Festival, with or without money." Beijing recorded temperatures as low as minus 4 degrees on Tuesday. But crowds of people waited at the Beijing Railway Station to go back home.